At Yoast, we love to make our work available for everyone. We try to develop products that follow accessibility guidelines to take away any technical hurdles people may stumble on. But we can always take an extra step to help the user navigate the front-end. That’s why we’ve added a wizard to Yoast SEO 3.6, one that guides the user through the initial set-up. Following hot on the heels of the 3.5 release, which focused on fixing bugs, we now release Yoast SEO 3.6. 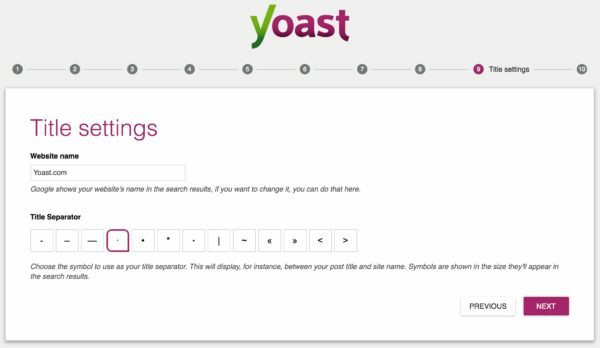 In this release, we’ve worked hard on getting a better experience when opening Yoast SEO for the first time. It can be rather overwhelming and the amount of setting up you have to do is pretty serious. Settings are a necessity. You have to make the right choices to get the most out of Yoast SEO. To help people navigate this, we’ve added a ten-step process that lets users gradually fill in the details of their site. Among other things, you can specify the environment in which your site is running, the type of site, social profiles, post visibility and Knowledge Graph metadata. You can also set up Google Search Console and choose the title settings. 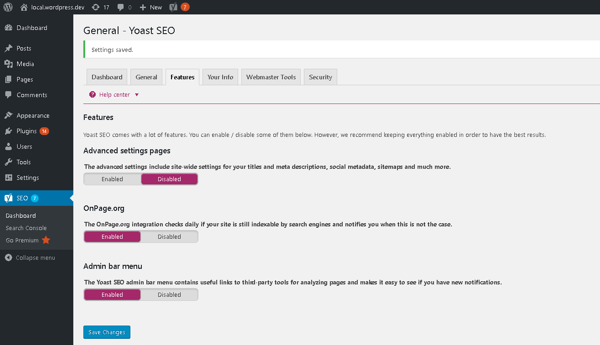 In the end, the user has a working install of Yoast SEO with the most important settings filled in. After running the wizard, the settings will be hidden. You don’t need these anymore, so they don’t have to be in the sidebar menu. You can turn these back on, of course. If you’d like to rerun the wizard you can launch it from the general tab on the settings page. We hope this feature makes it a little less overwhelming to open Yoast SEO for the first time. 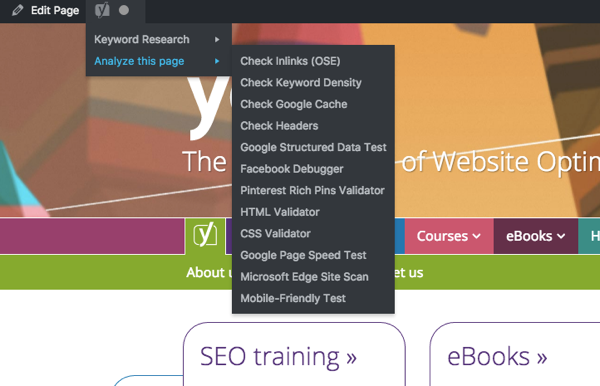 The Yoast SEO dashboard has a new Features tab. Here you can enable/disable certain features. If you want, you can turn the advanced settings page on or off. Should you turn these off, they’ll disappear from the nav bar on the left-hand side as well. We’ve even made it possible to enable or disable the admin bar in Yoast SEO. We’ve had multiple questions about the admin menu bar. Some people want to turn it off. That’s ok, and we’ve added that possibility, but you’ll lose a lot of handy checks. You’ll have no easy way to validate your HTML or CSS, or the mobile friendliness and speed of your site. But that’s all up to you of course. You can always turn the admin bar back on if you need it. As always, we’ve posted the full changelog on WordPress.org. Happy updating!